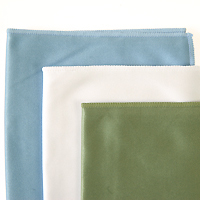 Our most popular tight weave cloth, this 6" x 7" micofiber cloth is ideal for small device screen cleaning. Low lint, washable, reusable and long lasting. Save on disposable products and cleaners. Uses include: Lenses, small LCD displays, industrial critical cleaning, cameras/camcorders, cell phones, optical/sun/safety glasses, LED read-outs/gauges, CDs/DVDs, and much more! Many options available for promotional use as well. We can put your logo or business information right on your cloth! These come with zig zag edging. I love this cloths and use them constantly. I tuck the inside Christmas cards or small gift bags to co-workers with a couple of small pieces of candy. The idea has always gone over well and is inexpensive enough to give to a large group. Thanks for the great gift ideas, Carrie! We can also etch on cloths should you be interested in personalizing your gifts! This cloth is wonderful. It is really smooth and I love how it feels. I wear glasses and I am a photographer. I have tried other microfiber cloths for lens cleaning and they are not all the same. These cloths work great and are a giant step above others that I have tried. I will order more in the future. Excellent condition. true to description, love the color. I purchased these silky cleaning cloths for my students to keep their iPad screen cleans. They are just similar to ones that I receive with an eyeglass purchase. I was surprised by the superior quality and will purchase more when I need to replenish my supply. I used to have students use microfiber cleaning cloths but these silky ones are perfect for iPads since they easily fit between the iPad screen and the case cover for storage. On a funny note, they are so soft and "cuddly" that some of my students neglect to put them down after cleaning the iPad screen. Students often continue to touch and caress them as they would a favorite Teddy bear! I highly recommend this product. Great for cleaning AG lenses. Prompt delivery- recommended without reservation. These are very nice cloths. They hold up well in the washing machine and they're made out of fine material. Shipping was very quick and they even came with a couple free samples. Overall its a wonderful product. I love these cloths! The material is durable but soft. They're a very cute purple color! I would highly recommend this product. 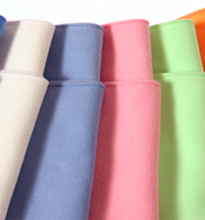 We have used these Microfiber cloths for some time now and have been pleased with the overall quality of the product. The Black Silky Weave Microfiber Cloth feels just a little bit thicker than some of the other cloth in this category. It also looks very professional with business computers/devices. Highly recommended. The Burgundy cloth provides a nice alternative if you're looking for a darker red in this type of cloth. It also has a light shine to it making this cloth look more expensive. For the price, this is a great deal! This cloth has a slight shine to it and has perhaps a hint of teal in the light blue. A very nice color. They work great and I keep several around the house and also make a point of traveling with one for my glasses. Buy it! I love these. So much better than those little packet wipes. Pros: Great Price and Quality Cons: Where's the pink? These cloths are just what I was looking for! I have to admit that for the price, I didn't expect such a nice product. Other retailers were charging quite a bit more for a very similar, (if not the same) cloth. Thank you for supplying our business with quality while still looking out for our budget! We?ll be back for sure! These lens cloths do the job of much costlier but identical items from other suppliers. For the cost of one cloth from other suppliers, I got ten, enough to put one in every conceivable nook and cranny (camera cases, desk at work, glasses case, etc). I'm very happy with the quality, size and speed of delivery. Will be ordering more from Photodon.